The surgical procedure for esthetic ridge preservation in the anterior maxilla requires successful completion of several interdependent coordinated steps to preserve the bony hard tissue ridge architecture and to preserve and maintain the ridge soft tissue profile. The first step in this process is the atraumatic extraction of the involved tooth. If possible, the reflection of a mucogingival flap on the labial aspect of the extraction site should be avoided. In addition to complicating the soft tissue procedures to preserve the interdental papillae of the extraction site with the adjacent teeth, the reflection of a full-thickness flap removes the periosteum from the underlying labial plate of bone, thus affecting the supply of nutrients that this soft tissue provides the thin cortical bone on the labial aspect overlying the maxillary anterior teeth. After the tooth is removed, a bony socket defect is present in the confines of the maxillary alveolar ridge. Overlying the bony socket at the extraction site are the soft tissue elements that comprise the connective tissue fiber apparatus, epithelial attachment, and gingival sulcus adjacent to the extracted tooth root. , Interproximally, these soft tissue elements combine in height to form the interdental papillae with the neighboring teeth. On the labial aspect of the extraction site, the soft tissue is thin and drapes apically, as defined by the gingival margin and the gingival soft tissue profile of the ridge. Maintenance of this soft tissue architecture on the labial and interproximal aspects of the ridge adjacent to the extraction site is critical for the esthetics of the eventual replacement tooth. Zenith points are the most apical points of the clinical crowns, which are the height of contour. Their positions are dictated by the root form anatomy, cementoenamel junction (CEJ), and the osseous crest, where the gingiva is scalloped the most. The zenith points are generally located just distal to a line drawn vertically through the middle of each anterior tooth. The lateral incisors are one exception to that rule, as their zenith points are placed more centrally or on the midline of the tooth margin. One of the most significant features of gingival esthetics is contour progression from the incisors to canine. The gingival esthetic line (GAL) is a classification for creating pleasing gingival level transition between the maxillary anterior teeth. GAL is defined as a line joining the tangents of the zeniths of the free gingival margins of the central incisor and canine. 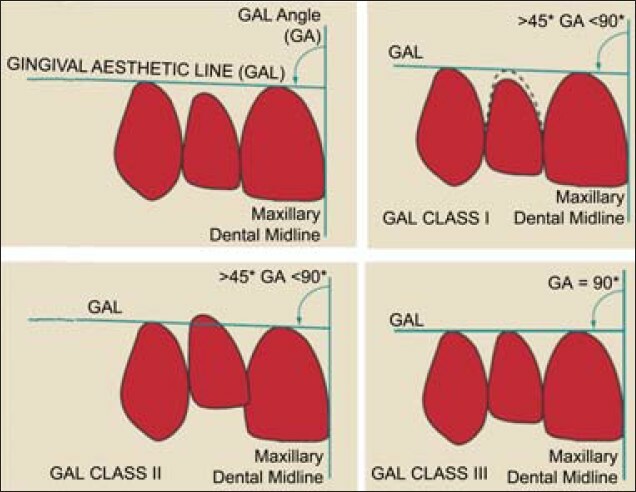 The GAL angle is formed at the intersection of this line to the maxillary dental midline [Figure 1]. Class I: The GAL angle is between 45° and 90° and the lateral incisor is touching or below (1-2 mm) the GAL [Figure 1]. Class II: The GAL angle is between 45° and 90° but the lateral incisor is above (1-2 mm) the GAL and its mesial part overlaps the distal aspect of the central incisor. 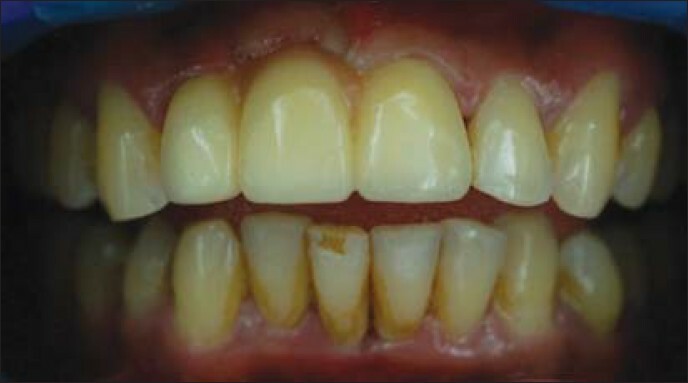 This situation is often seen in Angle's class II or pseudo-class II conditions, and adds variety to the dental composition [Figure 1]. Class III: The GAL angle = 90°, and the canine, lateral, and central incisors all lie below the GAL [Figure 1]. Class IV: The gingival contour cannot be assigned to any of the above three classes. The GAL angle can be acute or obtuse. A myriad gingival asymmetries are apparent clinically including recession, passive, and altered passive eruption, eccentric eruption patterns, loss of interdental papillae, clefts, and high frenal insertions. A 25-year-old male patient presented with an anterior fixed prosthesis which was esthetically unacceptable [Figure 2]. 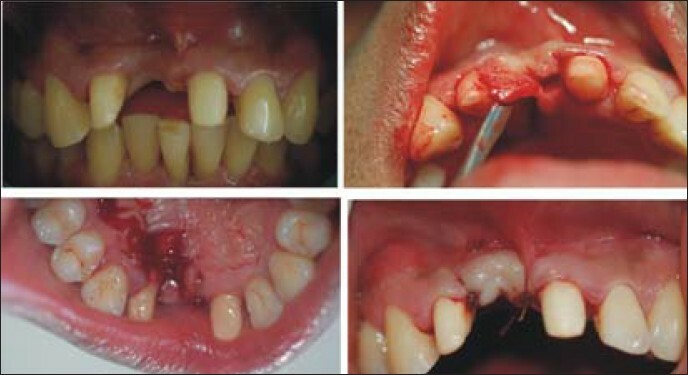 He had history of traumatic extraction of 11 resulting in loss of vertical height of the alveolar ridge. For which an acrylic (pink) obturator was placed over a period of 1 year this had become loose and mobile and was causing further gingival irritation [Figure 3]. The new treatment plan included soft tissue augmentation with the help of a roll flap procedure to bring back gingival esthetics and followed by a fixed partial denture with an ovate esthetic pontic. Following examination, the oversized teeth of the old FPD were shaped to get a satisfactory tooth size and a key or template was made with putty material. 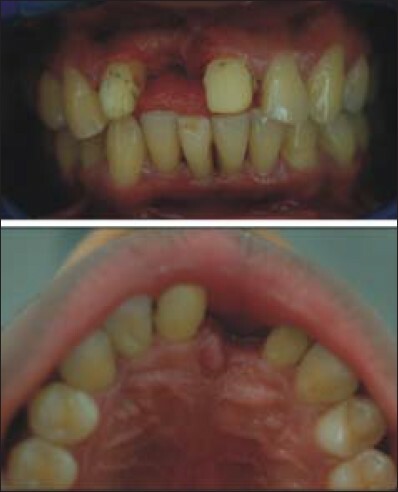 The bridge was removed and oral prophylaxis was done [Figure 3]. 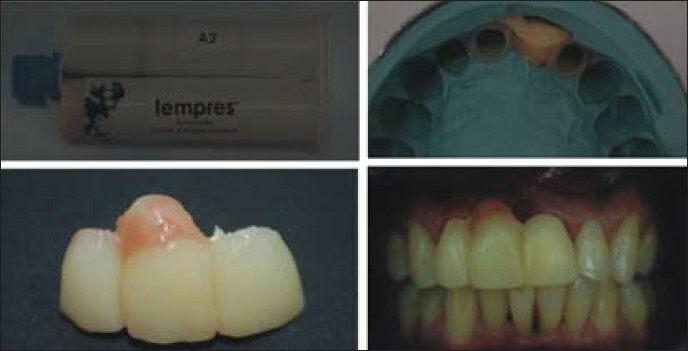 A temporary bridge with gingival extension made of pink composite was fabricated with tempress from the putty template (Tempress, Permoflo (pink), and Ultradent, [Figure 4]). 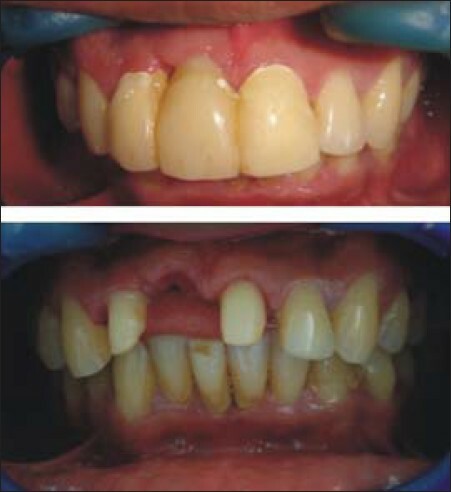 The check-up after 1 week revealed good gingival health with class 2 gingival esthetic line [Figure 5]. Ridge augmentation using the roll flap procedure was carried out [Figure 5], using palatal mucosa as a host site [Figure 5]. A rectangular pedicle of connective tissue was prepared on the palatal side of the defect. The epithelium on the palatal surface of the donor site was first removed. Supraperiosteal connective tissue was raised from the palate using sharp dissection. A pouch was made in the supraperiosteal connective tissue at the facial (labial) surface of the ridge. The pedicle was tucked into the pouch and resorbable sutures were placed close to the mucobuccal fold so as to pull the pedicle to the apical portion of the pouch [Figure 5]. The interim fixed partial denture was then placed back and the pontic 11 was converted into ovate design so as to create esthetic emergence profile [Figure 6]. The recipient site was allowed to heal for 3 weeks showed good healing [Figure 6]. Impressions were made for a 3-unit porcelain fused to the metal (PFM) bridge. The temporaries were then placed back. The final 3-unit PFM bridge was then cemented with excellent esthetic results. The patient was recalled after 6 months [Figure 7]. Figure 5: The "roll fl ap procedure"
Numerous surgical graft and implant procedures attempting to reconstruct a partially edentulous ridge or ridge defect have been described in the literature over the years. The procedures may be grouped according to the means used for ridge augmentation as (1) soft tissue augmentation procedures and (2) hard tissue augmentation procedures. The soft tissue augmentation procedure followed in this case facilitated a prompter recovery with acceptable results. The patient's expectations and clinical expertise are factors which govern the treatment outcome in such cases. 1. Pietrokovski J, Massler M. Alveolar ridge resorption following tooth extraction. J Prosthet Dent 1967;17:21-7. 2. Abrams H, Kopczyk RA, Kaplan AL. Incidence of anterior ridge deformities in partially edentulous patients. J Prosthet Dent 1987;57:191-4. 3. Schropp L, Wenzel A, Kostopoulos L, Karring T. Bone healing and soft tissue contour changes following single-tooth extraction: A clinical and radiographic 12-month prospective study. 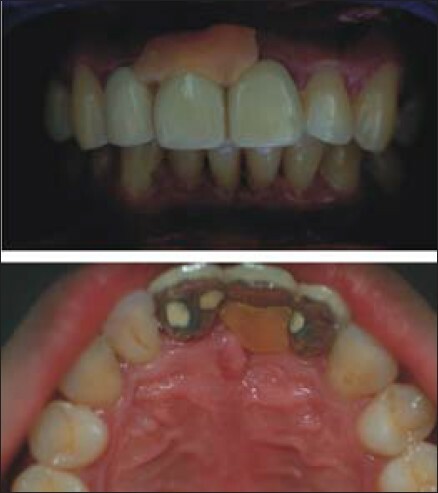 Int J Periodontics Restorative Dent 2003;23:313-23. 4. Grunder U, Spielman HP, Gaberthüel T. Implant-supported single tooth replacement in the aesthetic region: A complex challenge. Pract Periodontics Aesthet Dent 1996;8:835-42. 5. Gargiulo AW, Wentz FM, Orban B. Dimensions of the dentogingival junction in humans. J Periodontol 1961;32:261-7. 6. Ingber JS, Rose LF, Coslet JG. The "biologic width" - A concept in Periodontics and restorative dentistry. Alpha Omegan 1977;70:62-5. 7. Kois JC. Esthetic extraction site development: The biologic variables. Contemp Esthet Restorative Pract 1998;2:10-5. 8. Kois JC. Predictable single-tooth periimplant esthetics: Five diagnostic keys. Compend Contin Educ Dent 2004;25:895-6, 8. 9. Spear FM. Maintenance of the interdental papilla following anterior tooth removal. Pract Periodontics Aesthet Dent 1999;11:21-8. 10. Wheeler RC. Complete crown form and the periodontium. J Prosthet Dent 1961;11:722-34. 11. Lindhe J, Lang NP, Karring T. Clinical Periodontology and Implant Dentistry. 5 th ed. Hoboken, New Jersey: Blackwell Publishing; 2008. p. 1011-3.